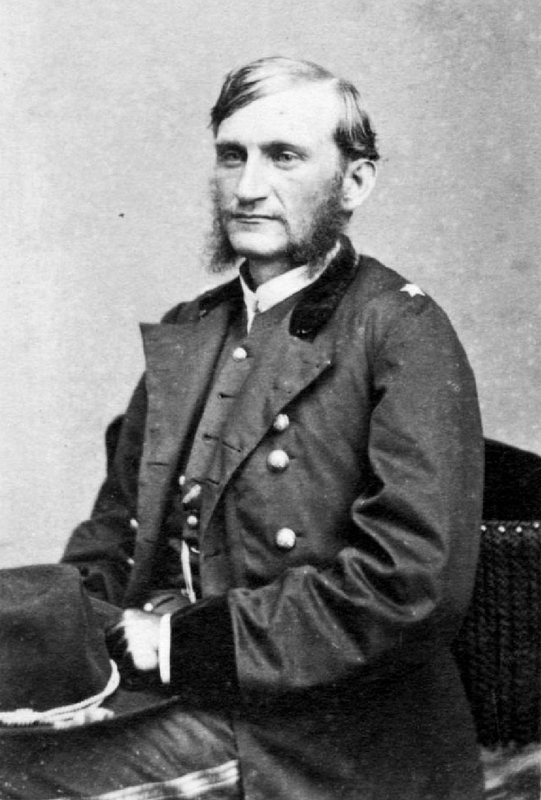 Brigadier-General Hugh Judson Kilpatrick, an 1861 graduate of the United States Military Academy at West Point, was the commander of the United States’ cavalry division that reached Hanover from Littlestown on June 30, 1863. This view, courtesy of the United States Military History Institute, was taken circa the 1860s. In today’s post John described the initial clash at Hanover on the morning of June 30, 1863. 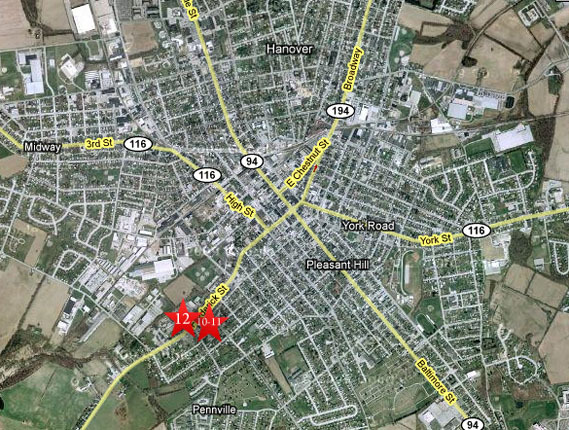 This map shows the location of where our videos were produced on the Old Hanover Road. Videos #1-#9 were shown in our previous Hanover posts. 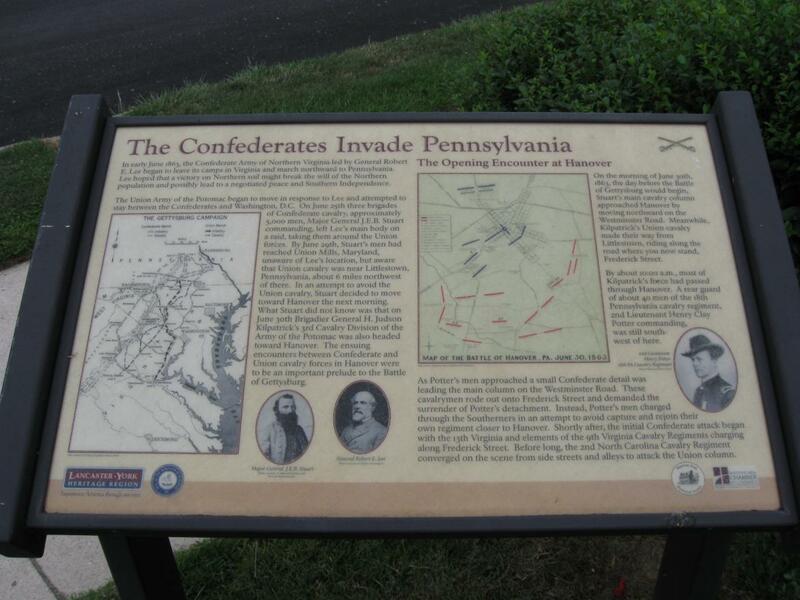 Videos #10 and #11 were taken at the “Confederates Invade Pennsylvania” wayside marker northeast of the junction of the Westminster Road/Westminster Avenue and Frederick Street. Video #12 was taken at the junction of Westminster Road/Westminster Avenue and Frederick Street. This map was created facing north at approximately 8:00 PM on Saturday, August 1, 2009. 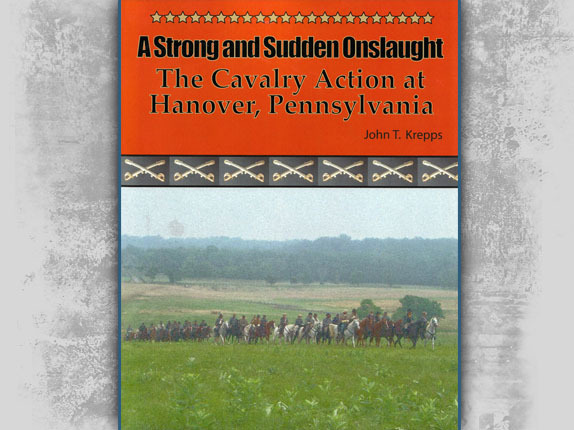 Gettysburg Licensed Battlefield Guide John Krepps is the author of the book, A Strong and Sudden Onslaught, The Cavalry Action at Hanover, Pennsylvania. 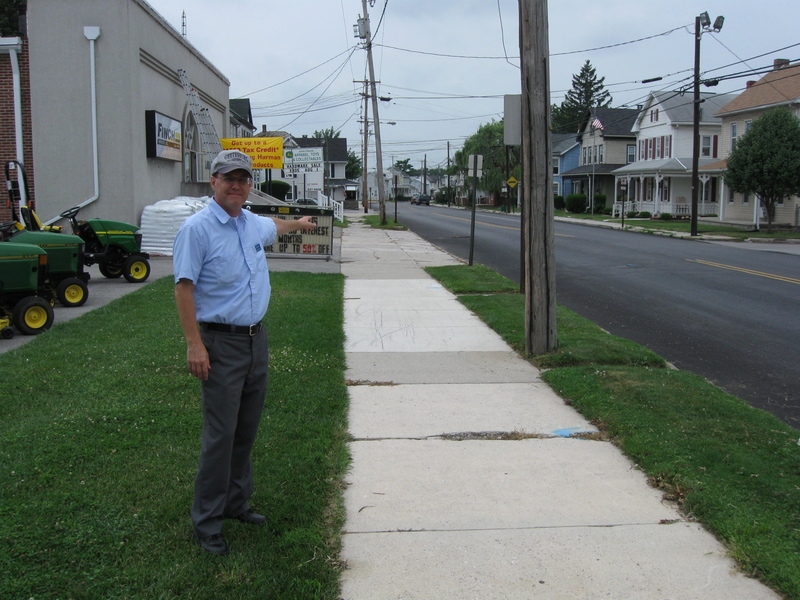 He is standing near the “Confederates Invade Pennsylvania” wayside on Frederick Street in the southwestern section of Hanover. This view was taken facing northeast at approximately 2:15 PM on Wednesday, July 29, 2009. 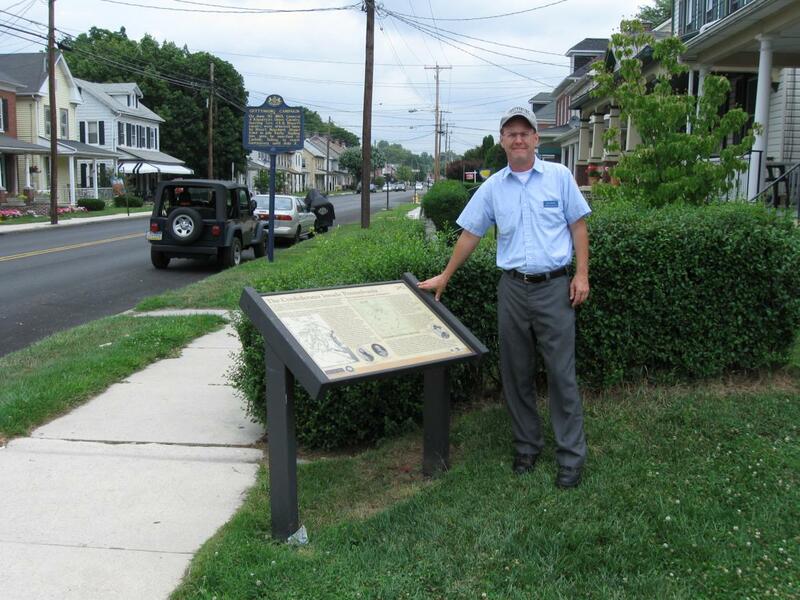 In Video #10 (Videos #1-#9 were shown in the previous Hanover posts) Gettysburg Licensed Battlefield Guide John Krepps is standing near Frederick Street in the southwest part of Hanover. He explains that in 1863 this area was much more open, and he shows us the junction of the Westminster Road/Westminster Avenue with Frederick Street. This view was taken facing northeast to southwest at approximately 2:15 PM on Wednesday, July 29, 2009. A closer view of the “Confederates Invade Pennsylvania” wayside marker. This view was taken facing northeast at approximately 2:15 PM on Wednesday, July 29, 2009. 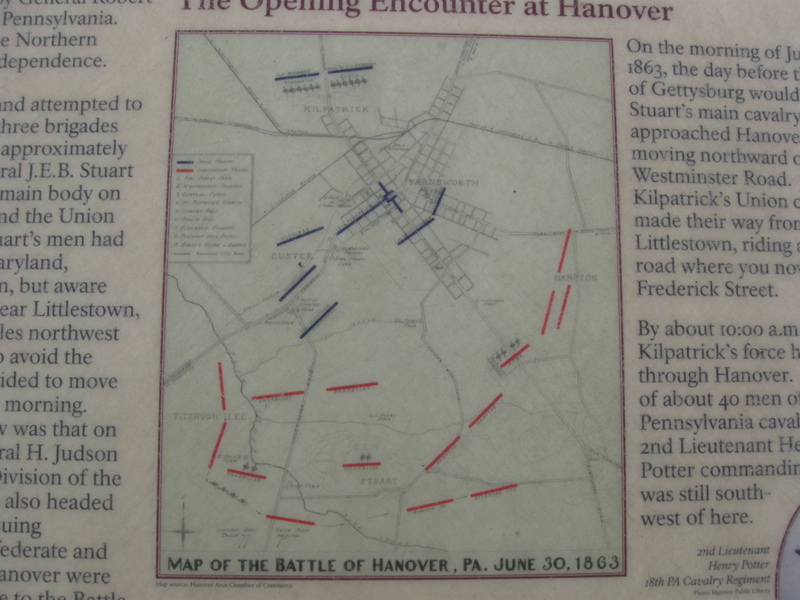 A closer view of the Battle of Hanover map on the “Confederates Invade Pennsylvania” wayside marker. This view was taken facing northeast at approximately 2:15 PM on Wednesday, July 29, 2009. 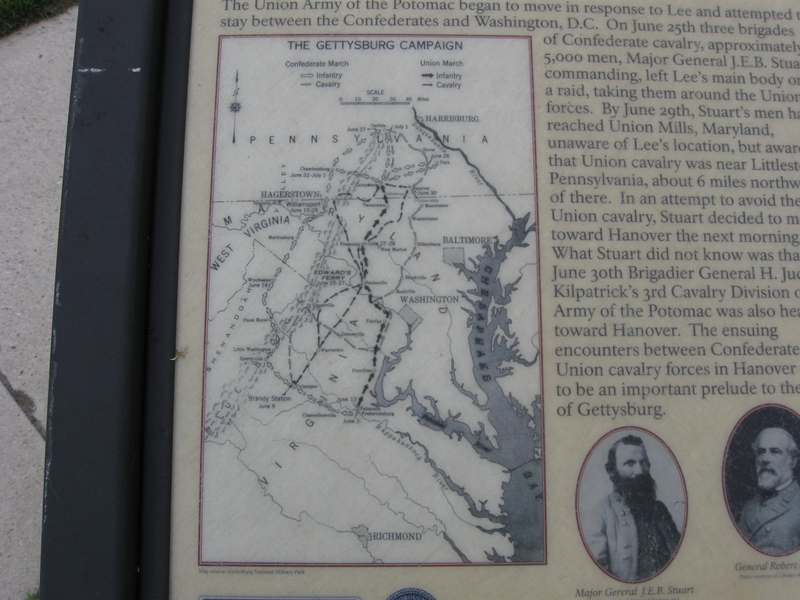 A closer view of the Gettysburg Campaign map on the “Confederates Invade Pennsylvania” wayside marker. This view was taken facing northeast at approximately 2:15 PM on Wednesday, July 29, 2009. 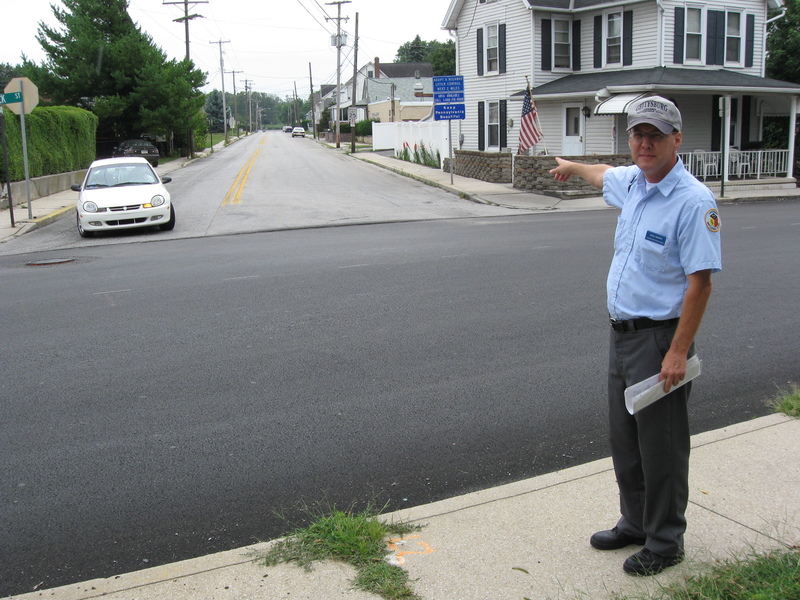 Licensed Battlefield Guide John Kress is pointing down Frederick Street towards Littlestown, and to the junction of the Westminster Road. The junction is where the white house is sticking out into the sidewalk. This view was taken facing southwest at approximately 2:15 PM on Wednesday, July 29, 2009. 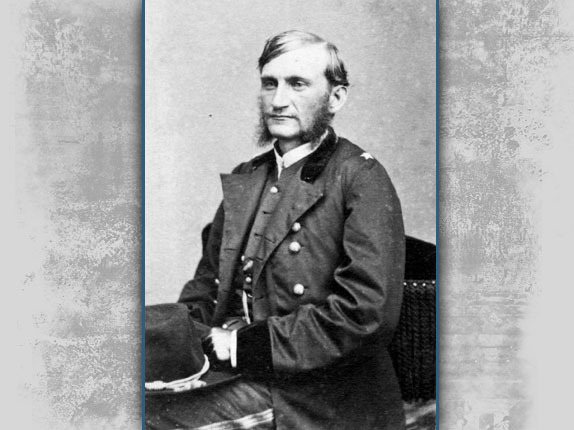 In Video #11 Licensed Battlefield Guide John Krepps explains the purpose for and the movements of Brigadier-General Judson Kilpatrick’s cavalry division towards Hanover on June 30, 1863. This view was taken facing southwest at approximately 2:15 PM on Wednesday, July 29, 2009. 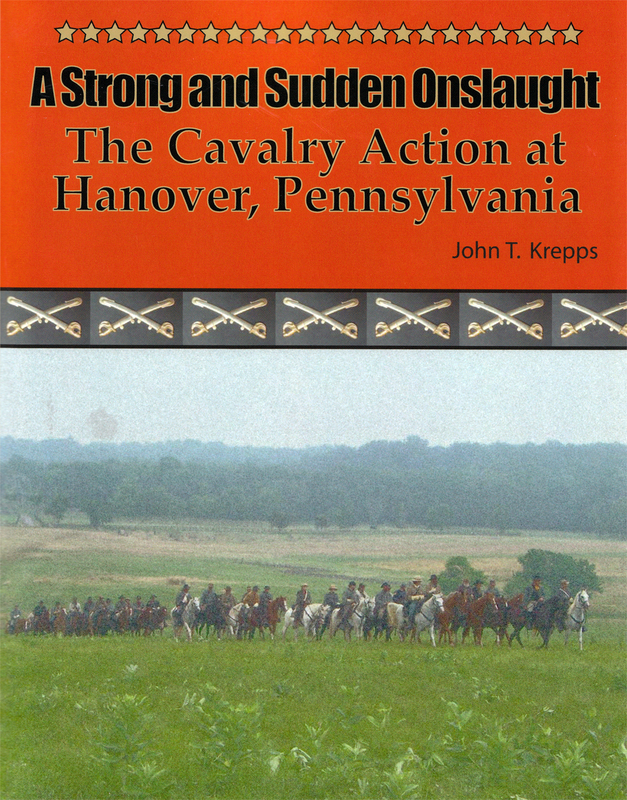 This map is from John Krepps’ book, A Strong and Sudden Onslaught, The Cavalry Action at Hanover, Pennsylvania. 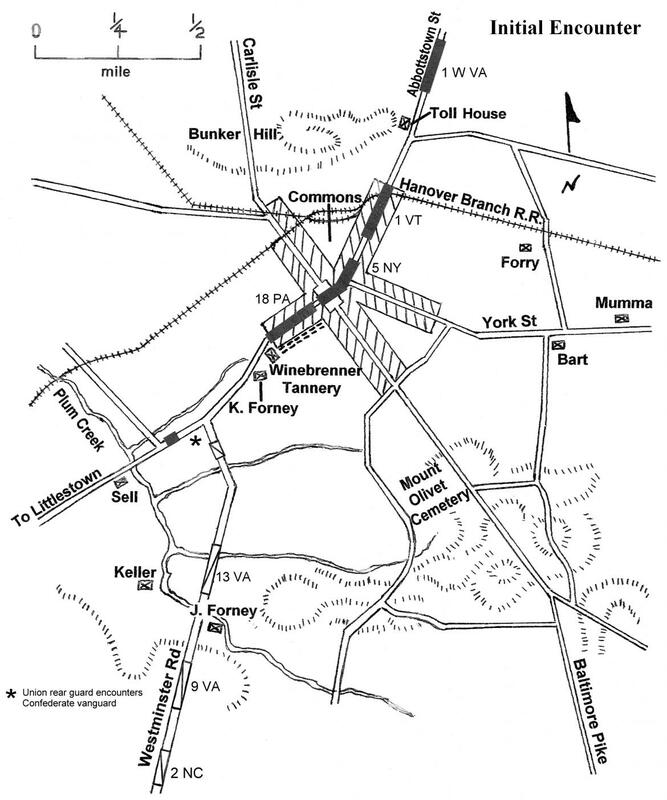 This map shows the first action of the Battle of Hanover at the junction of the Westminster Road and Frederick Street on June 30, 1863. Union units are shaded a dark color. Confederate units have lines running through them. Gettysburg Licensed Battlefield Guide Dave Weaver drew the basic map, and John Krepps drew the troop movements. John Krepps is at the junction of Frederick Street (from right to left as John’s arms are positioned)…This view was taken facing southeast at approximately 2:15 PM on Wednesday, July 29, 2009. 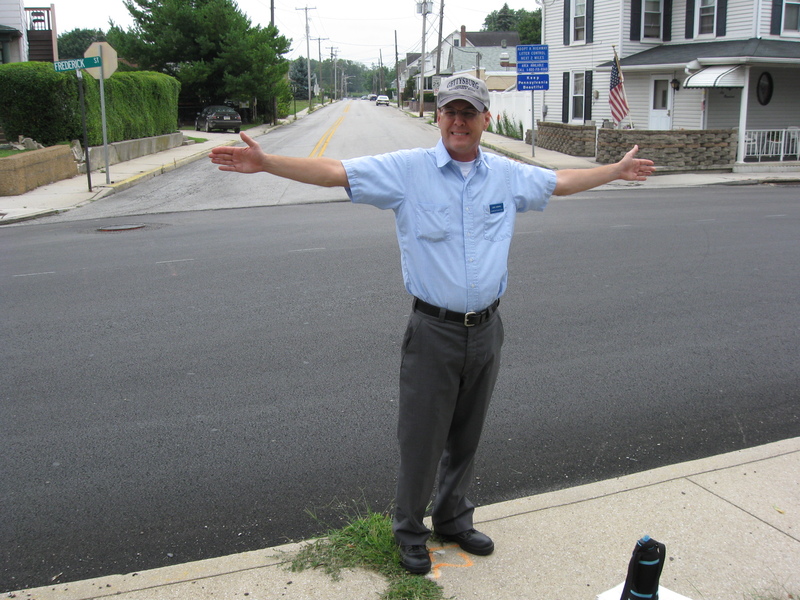 … and the Westminster Road/Westminster Avenue down which John is now pointing. This view was taken facing southeast at approximately 2:15 PM on Wednesday, July 29, 2009. In Video #12 John Krepps explains the initial clash of Union and Confederate cavalry at the junction of Frederick Street and the Westminster Road/Westminster Avenue. This view was taken facing northeast to southwest to northeast to southwest to northeast at approximately 2:15 PM on Wednesday, July 29, 2009.